West Ham have been fined £100,000 by the Football Association for the pitch invasions which marred their defeat by Burnley at London Stadium last March. 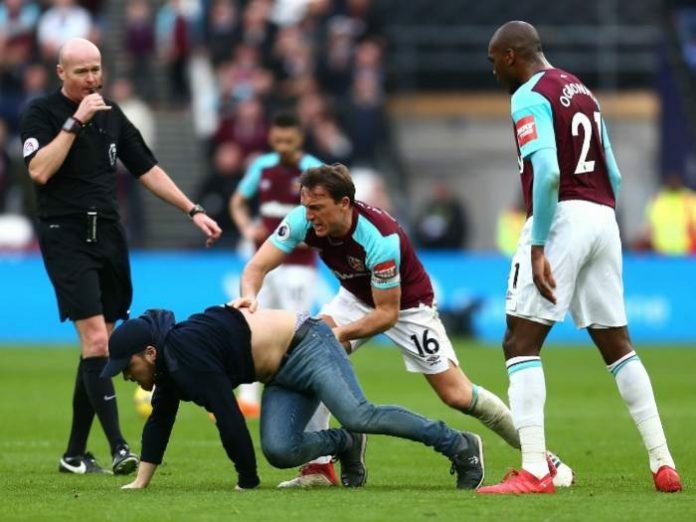 The Hammers were charged after fans repeatedly went on to the pitch, with one approaching captain Mark Noble. A fan ran on to the pitch with a corner flag, while supporters also threw coins and objects as they protested in front of the directors’ box. West Ham gave several fans lifetime bans following the trouble. Co-owners David Sullivan and David Gold were forced to leave the directors’ box for their own safety, with Sullivan struck on the head by a coin. And Burnley players were praised after they sheltered a group of young fans during the crowd trouble. Following the game, Noble admitted that the atmosphere at London Stadium was “horrible”, while Brady called it “one of the most painful days” in the club’s history. “Following the conclusion of the FA inquiry, we would like to reaffirm our sincere apologies for the scenes witnessed at our home game against Burnley almost a year ago,” West Ham said. “The club has done everything within its power to address the issues that occurred that day, despite having no control over match-day security operations – a point which is accepted and reflected in the FA’s findings. On Tuesday London Stadium owners E20 announced that the stadium operator, LS185, has been brought in-house. The agreement will help get the stadium “on a firm financial footing”, the company said.